Can you Venmo me later? Over the last few years mobile payments have surged in popularity. Growing access to smartphone technology has made sending and receiving funds incredibly easy. And as a whole, consumers have started to embrace the benefits of financial technology. At LendEDU, our team almost exclusively u﻿﻿﻿ses Venmo and we are not alone. In 2016, Venmo processed $17.6 billion in mobile payments, up 135% from the prior year. In January, Venmo’s parent company PayPal reported that Venmo processed $5.6 billion in mobile payments with over $2 billion processed in December alone. The mobile payment tsunami is on its way. But hey, not everyone might be a Venmo kind of guy or girl. We found that 65% of the Millennials we surveyed use a mobile payment application. Of those who use a mobile payment application, 68% of respondents said that they use “Venmo” most often. 2.3% of respondents said that they use “Square Cash” most often. 22.8% of respondents said that they use “My bank’s mobile payment app” most often. And, 6.9% of respondents said that they use “Other” most often. 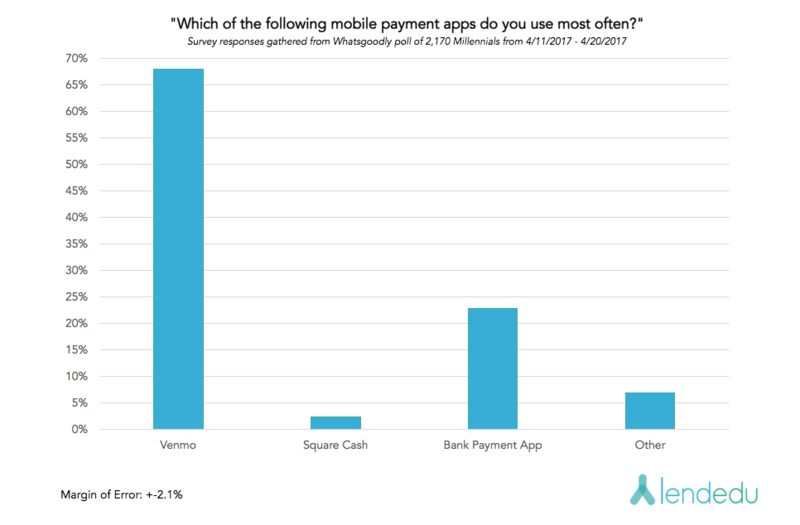 We thought it was interesting that 35% of Millennials we surveyed didn’t use a mobile payment application. Like jeez, don’t be that guy that doesn’t have Venmo. Everyone hates that guy… at least get Square Cash, sheesh. Mobile payments are increasing the quality of life for many Americans. They are making accounts payable and receivable in your friend group faster. And, mobile payments are helping the unbanked population in the United States gain greater access to financial technology.